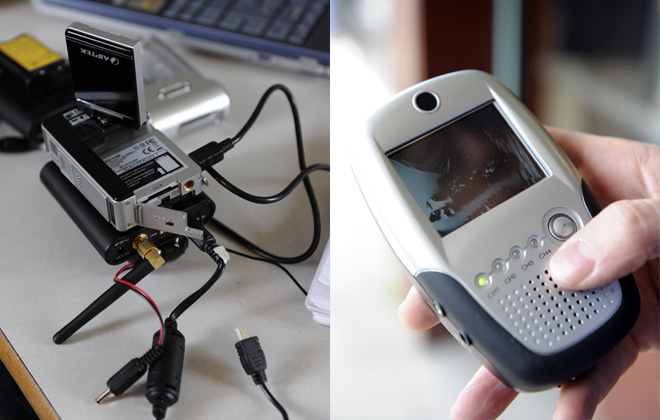 Our main tool for this workshop will be easily to obtained, simple to use and perfectly legal video receivers that can intercept the data collected by small CCTV video cameras often placed covertly in shops, offices and other public/private spaces. But we will also use ordinary media-gathering devices, our own eyes and ears and our social skills to identify and record evidence of covert operations in our midst, whether this is capturing gossip and rumour about the Suomenlinna's Island fortress or observing city planners' attempts to 'design out' specific social behaviours. The materials gathered on our main workshop day (Thursday) will be meta-data tagged and added to the Deptford TV collaborative video editing platform. During the course of Pixelache this platform will be used together with the open source video editing package kdenlive to create a series of 'versioned' edits of this material. We will also be inviting remote participants to contribute additional raw media and participate in editing. On Thursday, 10 March, we are inviting participants to join a walk through Helsinki/Suomenlinna with our CCTV 'sniffing' equipment and senses sharpened. No specific route is currently planned. We will determine this following a short introductory meeting on the day and shape the day according to people's specific interests. There will be chances to learn about and use all of these quite intensively across the entire time of the festival. Please sign up for the Thursday workshop, but also let us know your specific skills, interests and all the times you are available to work with us during Pixelache. The Deptford TV workshop is hosted by Adnan Hadzi, Lisa Haskel and Larisa Blazic.